The study analyzed levels of the smallest particulate matter — the kind that poses the biggest health risks — as measured by air-quality stations around the country. Even before wildfires started to engulf the Pacific Northwest with smoke and ash for the second straight summer, residents of the region were starting to experience pollution. The nearly 4 million people in the Seattle metropolitan area experienced 21 days in 2016 with elevated levels of the smallest particulate matter, which comes from sources like wildfire smoke and car exhaust, according to a study published Thursday by advocate groups Environment America Research & Policy Center and the Frontier Group. Particulate pollution increases the risk of premature death, asthma attacks and other adverse health impacts. 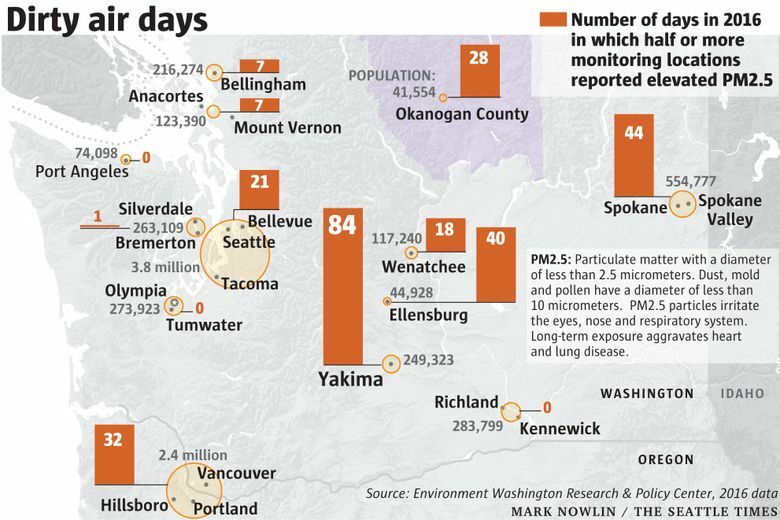 The Portland metro area had 37 days of polluted air in 2016, while Spokane reported 51 and Yakima posted 84. The report comes in the midst of one of the hottest and driest summers on record for the Puget Sound region, as air quality turned “unhealthy” by federal standards in multiple cities in Washington, due to a smoky haze from a record number of wildfires this year. Researchers say it’s too early to call the smoky days a trend, but now it’s more likely the region will see a few smoky weeks in coming years. Globally, last year was the third-hottest year on record, according to the National Oceanic and Atmospheric Administration, behind 2016 and 2015, and the 41st consecutive year in which annual temperatures exceeded the 20th century average, according to the report. Rising temperatures, changed wind patterns and droughts that foster wildfires of increasing intensity and frequency contribute to the problem, it said. The report shows polluted air is much more prevalent than Seattle in many U.S. cities, with 50 days of elevated particulate matter in New York, 74 in Detroit, 125 in Baton Rouge, Louisiana and 179 in Bakersfield, California. Gov. Jay Inslee on Thursday asked voters to approve I-1631, an initiative that would levy fees on oil refineries and other businesses that contribute to carbon pollution. Similar proposals have failed to pass the state Legislature in recent years.